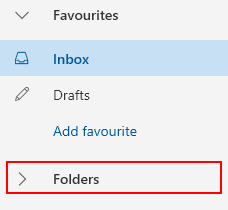 If you want to organize your messages in Outlook.com, you can create new folders or rename, move, or delete existing folders. You can also set up rules so that Outlook.com automatically moves messages into folders depending on conditions that you specify. Which version of Outlook.com are you using? The instructions are slightly different depending on whether you're using the Outlook.com beta. Choose which version you're using to see the instructions that apply to you. See Instructions for the Outlook.com beta. See Instructions for classic Outlook.com. If you can't see your email folders, check that the folders are not "collapsed". Select > Folders to expand. There is an ongoing issue where some folders may no longer be visible in the Folders list, but you can find items saved within the missing folders using search. We are aware of the issue and are working on a fix. Inbox Incoming messages arrive in your inbox unless you’ve created an Inbox rule to redirect them to another folder, or they’re identified as junk email. Junk Email Messages that have junk email characteristics but that aren’t blocked by a spam filter before they reach your mailbox will automatically be moved to this folder. Learn more about how to help keep spam and junk email out of your Inbox in Outlook.com. Drafts If you start writing a message but don't finish, it will automatically be saved to your Drafts folder. You can come back to the message later to continue editing it, and then send it. Sent Items By default, a copy of every message you send is put in your Sent Items folder. Deleted Items When you delete a message, it’s moved to the Deleted Items folder. Most of what you can do with a folder can be found in the context menu that appears when you right-click a folder. Create new subfolder Use to create a new subfolder in the folder you right-clicked. Delete folder Moves the folder and all its contents to Deleted Items. Delete all Moves all the items in the selected folder to Deleted Items. Mark all as read Marks as read all items in the selected folder. Rename Give the folder a different name. Default folders, such as the Inbox folder, can't be renamed. Create new folders to organize your messages as you like. For example, you can create a folder for a specific project, for all messages from a particular person, or for all messages sent to a distribution group that you’re a member of. At the bottom of the folder pane, select New folder. In the new folder box, enter a name for the folder and then press Enter. In the folder pane, right-click the folder to which you want to add a subfolder. Note: You can't rename default folders such as Inbox, Drafts, or Deleted Items. In the folder pane, right-click the folder you want to rename. Enter a name for the folder and press Enter. You can't change the order of folders under Folders, and you can't move sub-folders into the main Folders menu. Sub-folders must always be inside another folder. You can reorder folders or any other items in your Favorites list. To make a folder a Favorite, click the star to Add to favorites. Note: If you accidentally move a folder to become a sub-folder, create a new folder and copy all your email from the sub-folder to the new top-level folder. Note: You can't delete default folders such as Inbox and Sent Items. In the folder pane, right-click the folder or subfolder you want to delete. When you delete a message or folder, it’s moved to the Deleted Items folder. 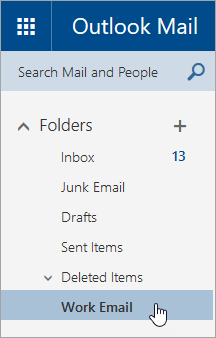 You can either manually remove messages from the folder or you can set Outlook.com to automatically empty your Deleted Items folder when you sign out. At the top of the screen, click Settings > View full settings. Select Mail > Message handling. Under Message options, select the check box next to Empty my deleted items folder. To learn how to restore deleted messages, see Restore deleted email messages in Outlook.com. Use commands on the Outlook.com command bar or set up rules to have Outlook.com automatically move messages into folders as you receive them. Commands like Sweep and Move to let you automatically delete or move messages from a particular sender. Commands appear on the Outlook.com command bar when you select a message in your inbox. Sweep lets you quickly delete unwanted emails in your Inbox. When you select a message, you can automatically delete all incoming email from that sender, keep only the latest email and delete the rest, or delete emails older than 10 days. Move to lets you move a message a specific message to another folder. Use rules to automatically move messages into folders as you receive them. In your inbox, select a message to which you want to assign a rule and select on the command bar. Select Create rule. The Create a rule dialog box opens. Choose a folder to which you want to move messages from that sender. To choose other conditions and actions, select More options. By default, the Stop processing more rules check box is selected. When this is selected, subsequent rules will be ignored, even if they apply to the message. Select OK to save the rule. Drafts If you create or respond to a message, but can’t finish it right away, it will automatically be saved to your Drafts folder. You can come back to the message later to continue editing it, and then send it. Delete Moves the folder and all its contents to Deleted Items. Move Opens a window so you can move the selected folder to a new location in the folder hierarchy. You also can select and drag a folder to a new location. Note: The next time you sign in, folders you created will be arranged in alphabetical order. Next to Folders, select Create new folder . .
Below Folders, right-click the folder to which you want to add a subfolder. Under Folders, right-click the folder you want to rename. You can drag a folder to a new spot in your folder hierarchy, or you can use the Move option in the shortcut menu. Below Folders, right-click the folder you want to move. In the Move Folder window that opens, choose a new folder to move the folder into, and select Move. You also can create a new folder to move the folder into by right-clicking the parent folder you want and choosing Create new folder. Use Inbox rules to automatically move incoming messages to specific folders based on criteria you choose. Below Folders, right-click the folder or subfolder you want to delete. When you delete a message, it’s moved to the Deleted Items folder. 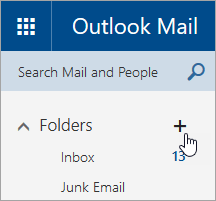 You can either manually remove messages from the folder or you can set Outlook.com to automatically empty your Deleted Items folder when you sign out. At the top of the screen, select Settings > Options. Select Automatic processing > Message options > Empty the Deleted Items folder when I sign out. Move to lets you move a message a specific message or automatically move all messages from that sender to another folder. Select Create rule. The New inbox rule dialog box (form) opens. Name Shows the name of the sender. When the message arrives, and it matches all of these conditions By default, three conditions are set for the received message. Select the arrows to choose other conditions. If you want to use more conditions, choose Add condition. Do all of the following By default, one of three predefined actions is set. Select the arrow to choose other actions. If you want to add another action, choose Add action. Except if it matches any of these conditions By default, no exceptions are set. Select the arrow to set an exception to the conditions above. Choose Add exception if more than one is needed. Stop processing more rules By default, the check box is selected. When this is selected, subsequent rules will be ignored, even if they apply to the message.